We were recently contacted by thinkmoney to see if we would take part in their competition. Since it was a craft competition, something the girls love doing, I said yes. We were given £30 to spend at Hobbycraft to buy some bits and pieces. 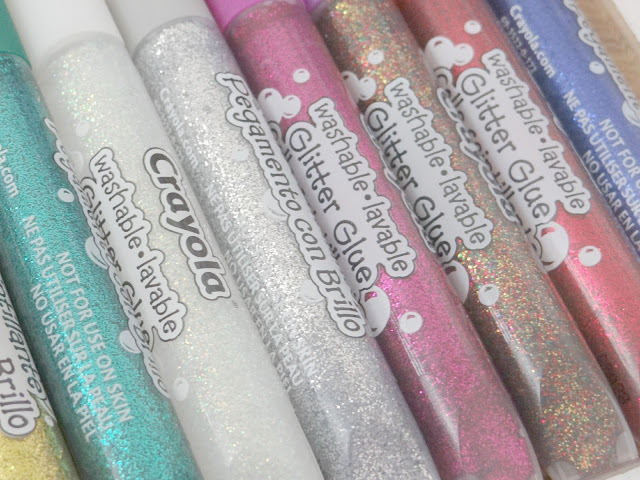 I decided to buy some paint, paint brushes, glitter, glue, glue sticks, paint pots, googly eyes and glitter pens which are some of the girls' favourite things in arts and crafts. Sometimes I sit down once the girls are in bed or in school and I do worry about the girls' future. Prices will be going up on most things in future and let's face it, kids don't know a thing about money do they. I struggle with money and I would really like it if my girls are more stable financially than I am. 1. 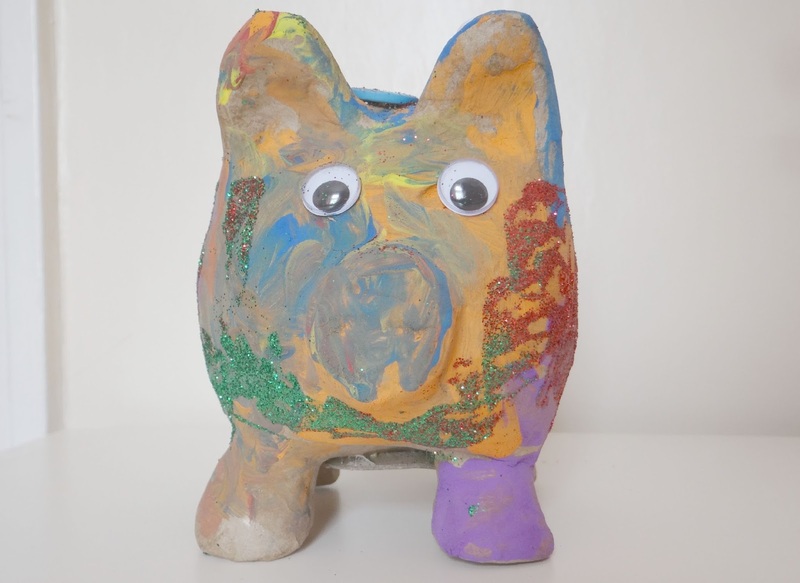 Money doesn't grow on trees - If you're a parent then you will know that all children think money grows on trees. We obviously know that this is not true. Children will learn nothing about money if we don't talk to them about it. We should learn children that you have to work to earn money, show them that working hard is worth it. You can explain to them about how you earn your money and how they can earn money as they grow older. Get them involved and get them to know some facts whilst they are young. 2. 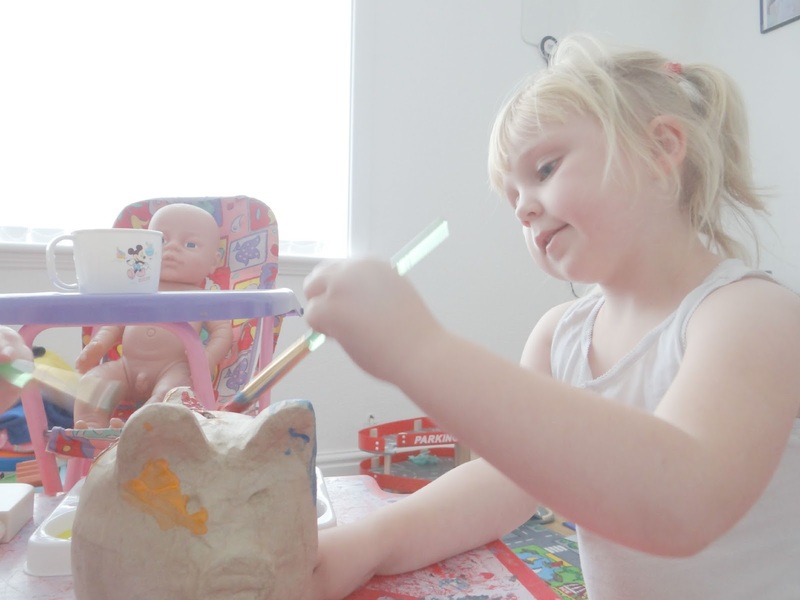 Budgeting - This is something I have already started with my own children. We need to learn them that money can't buy everything. Most of the time we need to budget our money. Maybe one week we won't be able to afford some things, so we budget and maybe get it the following week. We need to learn our children that even if we have a big lump sum of money in our bank from our paid jobs, or somewhere else, we need to learn them that we can not spend it all at once. Let's face it, we have bills to pay, we have to pay to keep a roof over our heads. 3. Save - I think it is always a good idea to save money or even open a savings bank account and put money aside weekly/fortnightly or even monthly. You could teach your children to do this by having a piggy box. If your child wants something, learn them that they will have to save up for that item. With this you could also learn them about how much things cost. Back onto the craft competition! 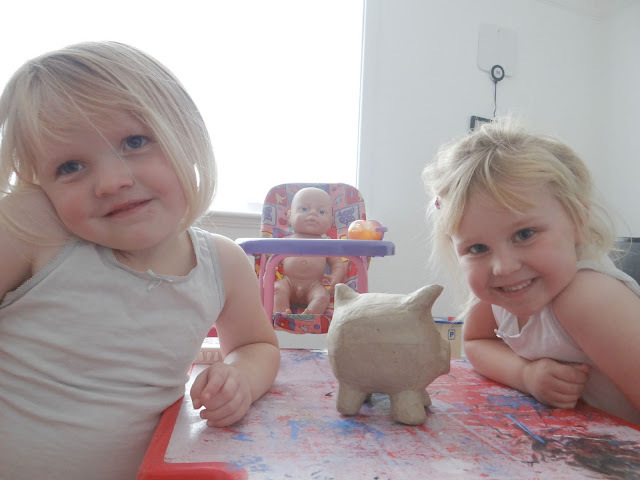 The girls were so excited when we received the piggy bank and other products. They couldn't wait to get started. We had a lot of fun painting, gluing and sticking. 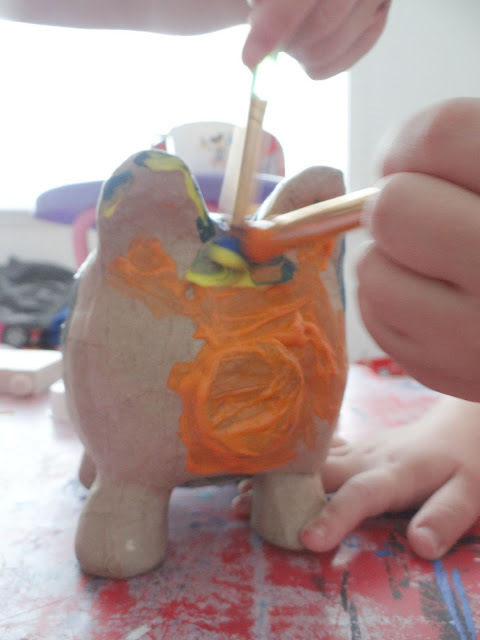 Since we only had one piggy bank I decided to let Mia do one side and Elliw do the other side, luckily they didn't mind. 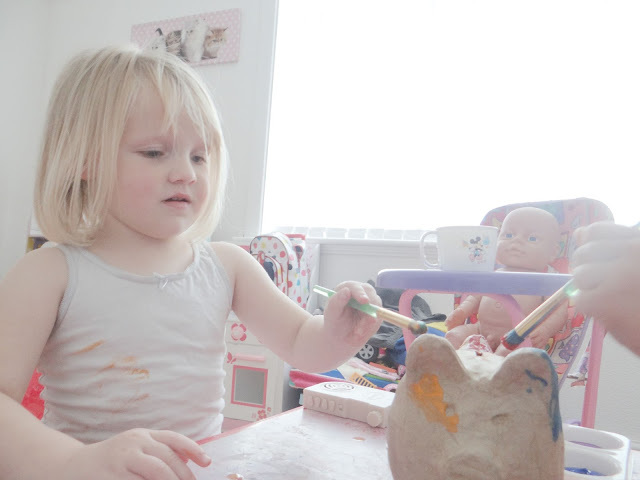 I realised whilst the girls were painting, they were learning about the colours mixing together and Elliw was learning to say the colours clearer, since she has a delay in her speech it was a big thing for me and her. It started to get really messy! Elliw decided to put her hands into the paint and rubbing it on the spare pieces of papers but luckily we cleaned her hands up just in time. 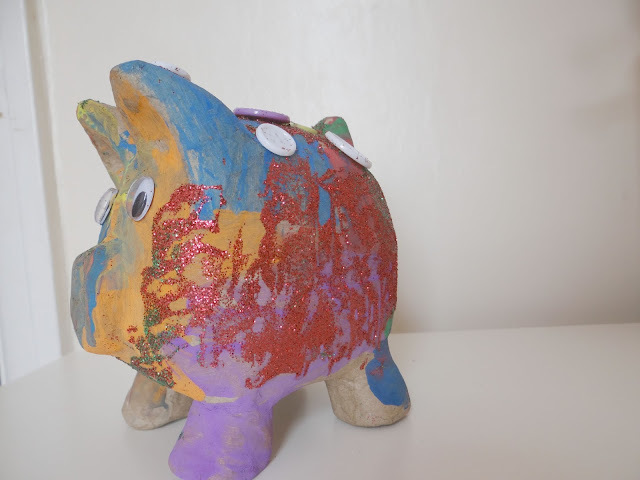 Since we had quite a lot of paint left after painting the pig, we decided to let the girls paint some pictures on spare pieces of papers. 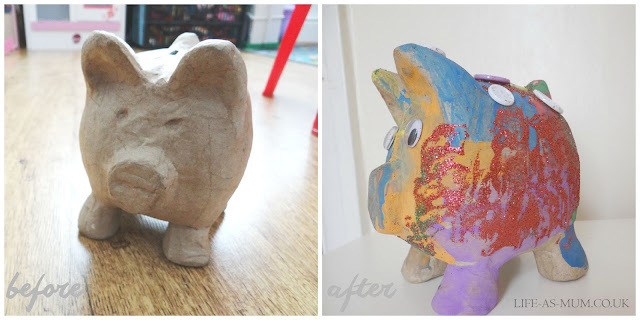 A few days after the pig dried we decided to glitter and button it up! 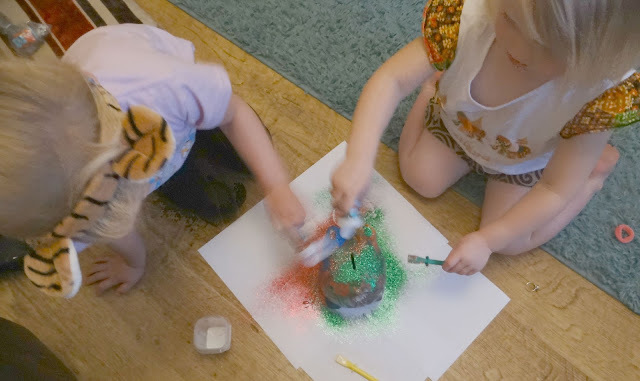 Mia and Elliw love glitter, it got a little messy but who cares, they had fun. We had some green and red glitter. Elliw decided to have the green and Mia had red. Again, they did their sides and then mixed it up a little in the back. We added some googly eyes in front and some buttons on the pig's back and there you have it! Mia and Elliw's piggy bank. 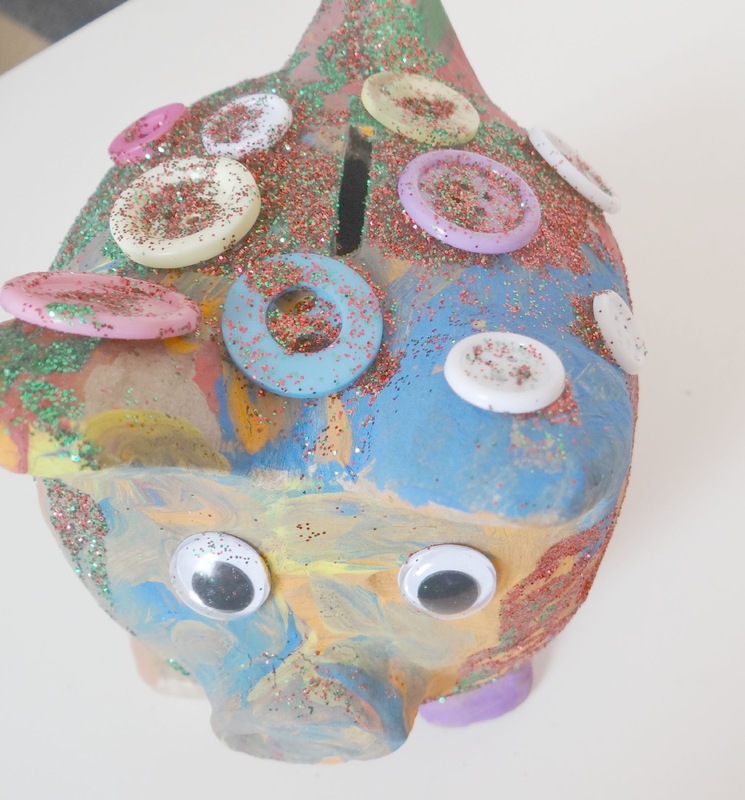 Mia and Elliw's very colourful and glittery piggy bank! 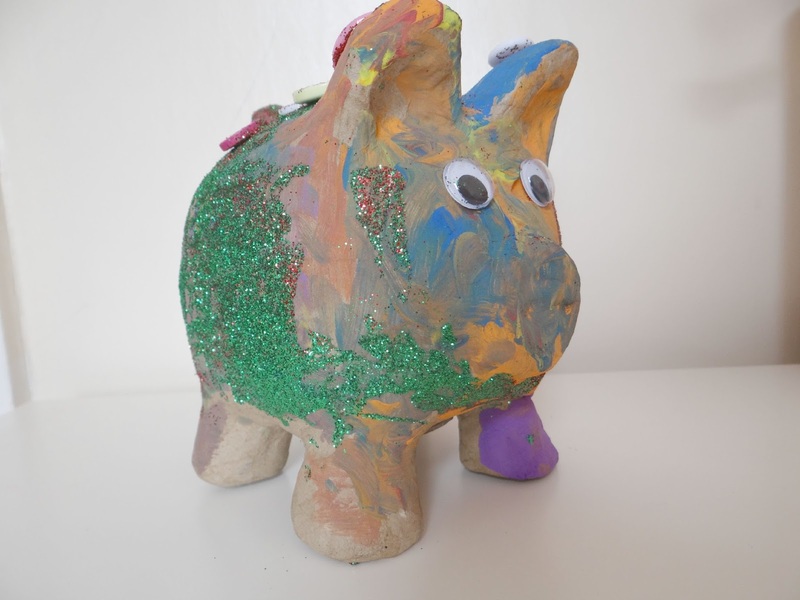 * We were given a £30 voucher to spend at Hobbycraft online/instore to buy products to decorate our piggy bank. This post is being entered in a competition. The winner will win £200. Your girls are so talented! Del iawn! Can't wait until mine are old enough for crafts. Eldest is into drawings but not old enough to do much but scribbles yet!! I will be teaching mine about money - we're both accountants so kinda my job to do that! 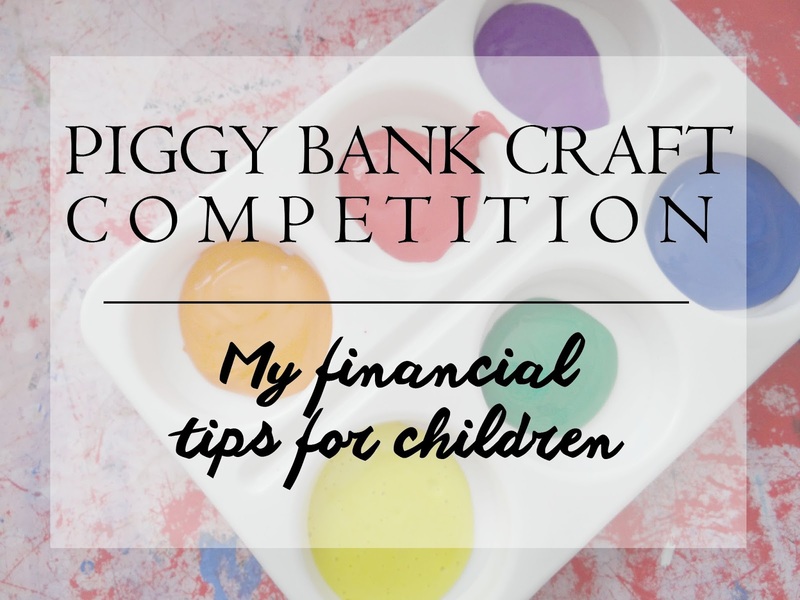 I adore those little piggy banks! It reminds me of the one I had as a child. Thank you for hosting this fab linky ..this was my first time here.